The District of Assiniboia was created in the North-West Territories in 1882 and comprised the southern portion of present-day Saskatchewan. The district name was derived from that of the Assiniboin Indians who once inhabited the region. 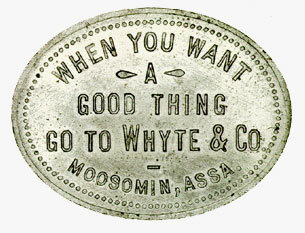 In late 1890 a merchant by the name of Andy Whyte opened a general store in Moosomin (a settlement about 12 miles from the Manitoba border), and in 1893 Whyte and Company issued oval-shaped tokens in denominations of 5, 10, 25, 50 cents and 1 dollar. These tokens were apparently produced in four different metals - aluminum, brass, copper and white metal - although the reason for this practice is unknown. A 2-dollar token was also issued, but the only known examples are in aluminum. The tokens, which were redeemable in merchandise, were a form of credit to Whyte's customers. They circulated until 1910 when Whyte sold his store because his business expectations had not been fully realized. The most interesting feature of Whyte's tokens is that they were one of the few series of tokens that bore the abbreviation for the district name of Assiniboia. On 1 September 1905, part of the District of Athabasca, the District of Saskatchewan and four fifths of Assiniboia were combined to form the Province of Saskatchewan as it exists today. The piece illustrated is made of white metal and is part of the National Currency Collection, Bank of Canada.